This reading is for the mother of an adolescent girl. Her daughter’s seemingly “overnight” change from sweet child to rebellious teen left the mother angry, hurt and confounded. This reading is about transforming unresolved issues from the mother’s teen years, as well as expectations—of herself as a parent, and of her daughter as a young woman. The first card, RENOVATION, is about major transformation through demolition. Old ideas about teens and mothers are an impediment for the mother. Her own parents were overly strict and controlling. As a teen, she acted out and rebelled. To compensate, the mother tried being overly lax with her daughter. Now the daughter rejects authority and is in trouble with the law. The Renovation card suggests taking a new approach to parenting—finding balance between supervision and freedom. 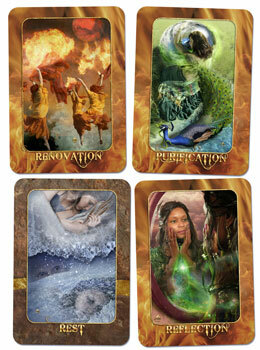 The PURIFICATION card indicates deep inner work and spiritual growth. Rather than comparing herself to her daughter and her mothering style to her parents’, the peacock suggests the mother convert her toxic feelings into something useful and beautiful. The Oracle’s guidance is to let her daughter be an individual, and allow her parenting to exist in the present. Further spiritual work is indicated by the REFLECTION card. By honestly facing the parts of herself she most dislikes and fears, the mother will become more whole and able to understand, accept, and communicate with her daughter. The only Earth element card, REST, is self-explanatory. The mother needs to put her own self-care high on the list to be present for her daughter. Notice the ice and snow in the artwork—in contrast to the fire of the other three cards. Slowing down and cooling off will help the mother with this intense process of parenting a rebellious teen. Finally, the absence of cards in Water and Air elements is a reminder to the mother to allow time for feelings (Water/Heart) and awareness of thought patterns (Air/Mind) in order to maintain balance.